You always hear about the autumns in New England, but they've got nothing on us here in Michigan! The brilliant yellows, oranges, and reds are in glorious display throughout the region. An October afternoon drive along our country roads brings you face-to-face with nature's magnificence. The tastes of the season are abundant at local Oktoberfest celebrations, harvest festivals, and old-fashioned barn dances. Warm cider, sweet doughnuts, and fresh, crunchy apples fill your senses with fall's goodness. 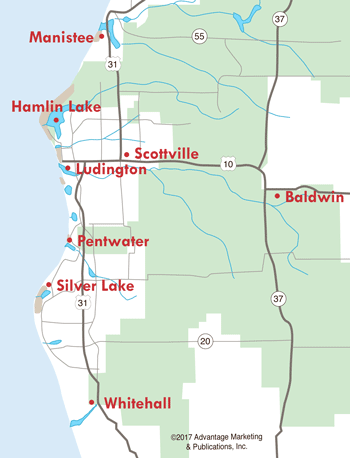 Now is the time to take a hayride, hike in the Ludington State Park, or visit the local pumpkin patch. The crisp air is a refreshing change after summer's heat, and many of us start gathering wood to keep us warm during the upcoming winter months. Autumn in West Michigan-this is where I want to be.